It has amazed me to see how many photographers, professional , semi professional, amateur and amateur enthusiast, have responded to the tiger opportunities at Tiger Canyons. Millions of rands worth of equipment is on display on any one day at Tiger Canyons. Literally thousands and thousand of images are being captured, as the staccato sound of four, five and sometimes six cameras, shoot at one time. Tigers running, stalking and romping. Tigers lying in pools or swimming across streams. Tigers posing on rock formations in the late afternoon Karoo sun. A white tiger cub hunts for crabs, her reflection clear as a mirror in the water. She ducks her head under the water, searching for frogs and crabs. The images captured are endless, of the highest quality and truly world-class. I often wonder to myself, what happens to all these images. Is it our instinctive response to the fact that we know that "saving the tiger is a lost cause" and we are recording a historical record, or perhaps we are just compulsive photographers, searching endlessly for that one elusive, magical photograph. The professionals are very clear, they sell the pictures for money. As the supply of tigers in the wild dwindles, the demand for good photos and hence the price goes up. The amateur enthusiasts are not so clear about what they do with their pictures. Vaguely they say they are memories, mementos. Recently I saw a magnificent documentary on the Tigers of Panna. Beautifully shot, the landscape and the tigers are breathtaking. Sadly the tigers of Panna are no more. It is certain that the Panna documentary has become a historical record of days when tigers thrived in Panna. Like the extinction of tigers in Sariska Park, it took the Indian Government a long time to acknowledge the tigers extinction from Panna. My belief in Governments capable of saving the tiger wanes daily, the only hope I believe, is in the hands of the private enterprise. I would urge all photographers, professional or amateur to make their pictures speak. Collectively, tiger photographers and tiger photos can made a difference. It's conceivable that Tigress Julie will have more pictures taken of her in her lifetime than even Princess Diana. Yet these pictures are worthless if they collect dust on some computer or are locked away in a cupboard. You, the photographer, must find ways to make your photographs speak! A majestic species is slipping to extinction. With this in mind, I have formed Tiger Photo Gallery and I am inviting all photographers who have visited Tiger Canyons or any Tiger Sanctuary, for that matter, to submit 6 of your most interesting pictures to Tiger Photo Gallery. I will place them on my website. Don't tell me what camera or lenses you used, rather tell me the effect the tiger had on you, the influence, the inspiration. Give me ideas on how, together, we can use our pictures to create pressure. We have the ability to communicate globally. We have websites, Facebook, YouTube, Twitter, cell phones and email at our disposal, let's use them! JV fails to rescue a giraffe that slipped in the river. He wants to film lions and crocs feeding from the inside of the giraffe carcass using a dummy croc. Shadow has returned to normal. She can walk, stalk, run, catch and kill as she did before. Her back right foot is slightly turned inwards, but otherwise she is perfect. Shadow's three cubs are healthy and still extremely shy. It is with regret that I have to inform you that the famous Mother Leopard known as 3:4 has passed away at Londolozi. She was one month short of her 17th birthday. As a young leopard with two young cubs, she and the cubs contracted sycoptic mange. With the help of Dr Dewald Keet, we were able to dart her and her two cubs, effectively saving their lives and extending her life for more than 12 years. Tributes to her have been pouring in from across the world. From guests, previous rangers and many who were privileged to know her. Londolozi’s renowned family of leopards mourns the loss of the 3:4 female and the end of a seventeen year era. In 1979, the original ‘Mother’ leopard was the first to become relaxed in the presence of game viewing vehicles. Her story and those of her prominent offspring of nine litters have brought guests back year after year to view her extended family. Of the six generations of leopards that originate from the Mother, her last remaining granddaughter, the 3:4 female has come to the end of her 17 year life. Londolozi’s general manager, Chris Kane Berman, remembers his first encounter with 3:4. She was ten days old with pale blue eyes staring out from the safety of a rocky outcrop where she was born. Stoff was twenty years old. “I have witnessed her decline over the past 18 months with nostalgia, sadness and great joy for a life well lived. She has touched so many lives including our staff and guests who have returned year on year to pay her homage” said Stoff. The response from our guests and staff to 3:4’s passing has been profound. 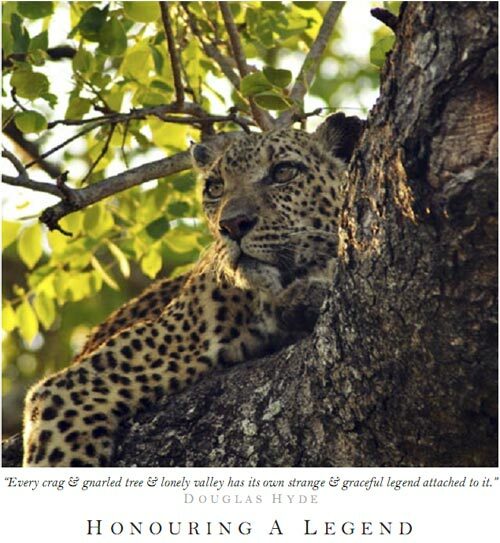 Messages from past rangers, guests and other members of the extended Londolozi family expressing their memories and feelings about this magnificent leopard have been pouring in. This week the Londolozi rangers are wearing black ribbons pinned to their shirts – a Shangane tradition usually reserved for the passing of close family members and friends. At 11h20 on the 25 July 2009 all activities at Londolozi will cease for one minute of silence in her memory. Please join us wherever you are and share the moment. On the Southern Cross Koppies in the heart of the Londolozi traversing area, three small, leopard cubs were born last week - and the circle of life continues it’s endless journey. I am with you in spirit, shed tears with you and empathise with your sense of loss. A relationship with a wild creature is beyond expression. It belongs in another realm, one which we yearn for but have only rare glimpses of. Everyone who knew 3/4 has been blessed with this insight...feel gratitude and it'll come around again...wait and see.. The words come hard and the tears flow easily, but each tear shed is filled to the brim with memories of a life privileged to have shared with the ThreeFour female. She was my mother, she was my teacher, she was my friend, she was my daughter, she is my soul mate. My heart swells with joy as we find her. I came here to see her again not knowing how close it was to her final hours in this physical world and was told she hadn’t been seen for a while, and that I shouldn’t raise my hopes of seeing her. I replied that to see just a track would be enough. A dear friend drove me out to her territory, and there she was, right next to the road, waiting patiently for me. So close to the place where I first followed her tracks on foot and found her with her first son, trying to persuade him to go off on his own and take his rightful place in the world as his sister had already done. The circle is almost complete. I look into her eyes now – as she nears the end of this life and approaches the next, and the light in them has not dimmed. It shines as brightly, if not more so, as the first day I was privileged enough to witness its pure beauty. I see a coat faded with time and remember how gold and lustrous it was in her youth. Her beauty is something seldom seen in the physical world. I have not seen it’s likeness before or since. But the graying of her coat is not something for us fickle humans to regret. It adds dimensions to her beauty rather than detract from it. It tells a story of a life lived longer, happier and fuller than the golden coat of youth ever could – free under the golden rays of the Londolozi sun. I marvel still at how she tolerates our presence – at how she allows us this window into her secret life. Even in these final days – she still lets us find her. I know that if she wanted to remain hidden, the best trackers at Londolozi, for all their brilliance, they are some of the best in the world, would not be able to find her - such is the way with leopards. But ThreeFour allowed us to find her time and time again. She gave us the rare opportunity to witness her life unfold – she shared her joys, of a simple rainfall after a long dry winter, of those first golden rays of morning on her coat after a cold winter night, of a full belly gracefully draped over the branch of a Jackalberry after a successful kill. She shared her sorrows with us – cubs lost, her mourning to touching to bear. She shared her hunts with us, over and over and over again, even though our presence there, as sensitive to her needs as we always could be, must have impacted negatively on her success. She bore no grudge, showed no sign of anger, just tolerance and forbearance. Every mark on her body adds to the incredible inner beauty that this leopard radiates. Each nick in her ear tells a story. The kink in her tail tells a story. The scars on her face tell of a desperate and fierce fight with a male leopard almost twice her size, to try and save her young. When I think of her territory, I cannot think of an empty one, waiting to be filled with some other. Her spirit compels me to think of the rocks in the Tugwaan that radiate with the warmth of the memory of her body, basking on them in the morning sun. Her energy and warmth will be part of those rocks forever. I am compelled to think of the many trees that bear the imprint of her claws as she climbed their branches to survey what was hers, or to drag a kill away from other predators. I have placed my fingers into those same sacred marks many times in the past and drawn energy from them. And the sands of the Tugwaan – No longer will they be pressed down with the imprint of her four feet, but so many grains have been touched by her over the years, her energy lingers in the spin of their atoms still. Each one carries a part of her inside them forever – just as they carry a part of her mother, who touched them before her. Her daughter walks the same paths now and touches those same grains of sand. They are all a part of ThreeFour’s story. It is a story that continues still, through the lives of her cubs and their cubs. And so though the tears pour down my cheeks now, and I can barely see to write, I cannot say goodbye, but simply - Fare Well my friend. May your passing to what lies beyond be a peaceful one. We will meet again in that place that you travel to – my soul is bound to yours. I end with the words of the poet Stephen Cummings – ThreeFour would have liked them. Of quiet birds I circled flight. At Londolozi Game Reserve, I am sitting with an 16 year old leopard who I call "Manana", the mother. She is probably the most famous and photographed leopard in the world and is the last remaining granddaughter of the original mother leopard which Elmon and I habituated way back in the early eighties.